I love a good bubbly. Don’t you? 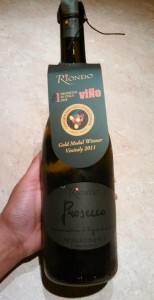 My new favorite is Riondo Prosecco Spago Nero from Veneto, Italy. It’s clean and slightly fruity. It’s fabulous all on its own or served with orange juice as a Mimosa or as a Bellini or with a splash of cranberry and St. Germain. Yes. I’ve had all of the above and that’s why I bought a case. I can’t tell you the last time I bought a case of wine. Let me take that back. I can’t remember the last time I bought a case of wine that was all the same kind. So, yeah, I’m kind of in love with this stuff. So that’s my 2013 holiday sparkling wine recommendation. This is what the bottle looks like. According to the internet, bottles should retail at $10-$13. I bought mine at Saratoga Wine Exchange. You can order online or visit their retail location at 43 Round Lake Road, Ballston Lake, NY. You can also give them a call at 877-493-6532.